Here’s the press release & details of my new poetry collection, Dark Corners of the Land. It’s only £5 if you buy it direct from Blackheath Books, order via this link. You can also buy one from me in person at the launch party, which takes place at the Henry Moore Institute on Wednesday night. More details about the event here. Dark Corners of the Land is Adelle Stripe’s third collection on Blackheath Books. These visceral confessional poems explore rural life, strange deaths, hunting, farming and hedonism, set against the backdrop of the small North Yorkshire town where she grew up. 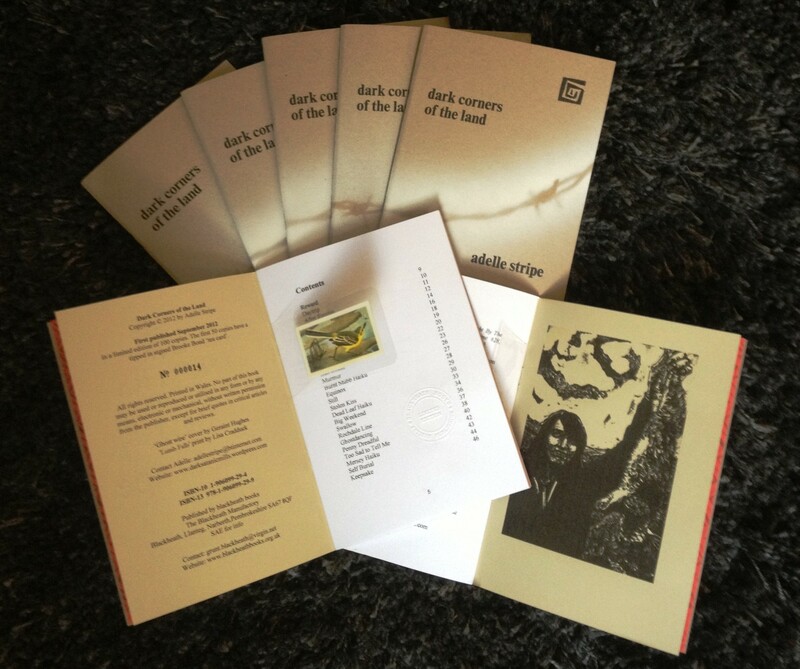 These collectable chapbooks are handmade on letterpress by Geraint Hughes. They feature a unique design of a stencilled barb wire pattern spray-painted on the cover; inside the first 50 copies, a vintage edition Brooke Bond Tea Card ‘Wild Birds in Britain’ is signed by the author. London artist Lisa Cradduck has created an exclusive print which also features in the book. Adelle Stripe was born in 1976 and lives in Mytholmroyd, West Yorkshire. She is a Creative Writing graduate from Manchester University’s Centre for New Writing and is a founding member of the Brutalist Poets. Her work has been widely published in underground publications in Britain and America. Blackheath Books is a publisher based in South Wales that specialises in artisan printing, publishing & bookmaking for discerning bibliophiles; a celebration of ordinary things. In the great tradition of the independent small press it provides a home for literary outsiders, and mavericks who swim against the flow of the mainstream. Their limited print runs, of signed and numbered editions, chapbooks and novels are all made by hand and with love. They make books because they like books. Blackheath Books are hand printed using vintage equipment and techniques on 100% recycled paper and card that contains a high percentage of post consumer waste. Blackheath receives no external funding and is a ‘not for profit’ organisation. Any profits they make are ploughed back into the press and fund future publications. They refuse to play the profit game and ask no one (apart from their readers) to underwrite their independence.